Learn an essential step in creating recombinant DNA molecules. Splicing pieces of DNA together to create a recombinant DNA molecule is used in numerous real-life applications in the fields of food production, agriculture, pharmaceutical production, and treatment of genetic diseases, such as producing nutrient supplements and insulin. 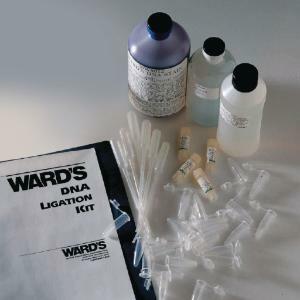 In this lab activity, students reconstruct a DNA strand by joining individual fragments that have been restricted with an endonuclease, and then test their results by running a gel. The entire activity, including staining, can be completed in one 90-minute lab session, or it can be divided into two 45-minute lab sessions. It comes with enough materials for eight ligation procedures, a teacher’s guide, and student copymaster. An electrophoresis chamber, power supply, and 1–5μL micropipettes, required, are available separately.